At least that is what I say. On Friday, I had a million things to do. Company coming into town. A messy House. 2 costumes still to figure out. 24 fabric pumpkins to make by this Tuesday for a church appreciation dinner. (And really more then that.) But, who wants to do all that when your oldest son has the day off of school? Not me. 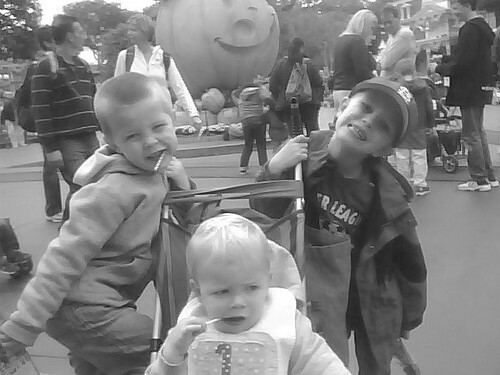 So instead I took my 3 boys to Disneyland with 3 other friends and their kids. (We have passes this year.) It was a blast. My boys were in heaven with their friends. 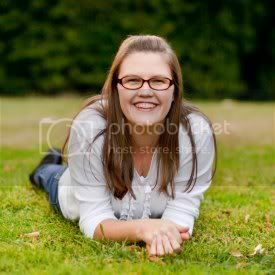 I had fun being with some of my friends. And amazingly enough (this was my first time ever taking all 3 without my husband) my boys were so good for me. It was a great day. I love when I can run away from things and spend time with my boys. I will be sharing some fun projects and tutorials this week. I cannot wait. Plus we are on the countdown until the "A Handmade Christmas" series starts. 8 more days. Wahoo! Spread the word. 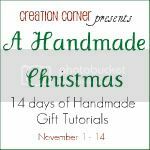 I cannot wait for 14 days of fabulous Handmade Gift tutorials from some amazing crafters. What an awesome day off from school! If i had passes to Disneyland I'd totally ditch my mile long to do list for Mickey!! ignoring the musts, is sometimes a must in order to maintain sanity. so glad you ere able to get away with your boys. enjoy your crazy busy week. Yes! That's the best way to escape insanity!